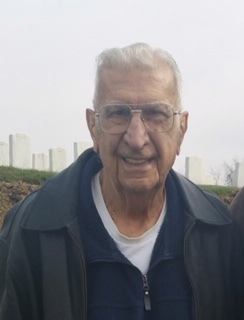 Obituary for Philip J. Ashear | Paul Henney Cremation and Funeral Tributes Inc.
Of Bethel Park; age 89: peacefully passed away on Thursday, March 28, 2019; son of the late Charles and Mary: devoted husband of 65 years to his High School sweetheart, the late Dolores F.: loving father of Philip R.(Carol) Ashear of Bethel Park, Celeste(Timothy) Palmer of Bethel Park; Cynthia(Thomas) Barr of Julian, PA; cherished grandfather of Laura(Robbie) Fulton, Katherine Barr(Agustin Aranguiz), Philip J. and Daniel Ashear; great grandfather of Audrey, Fiona and Olivia Brother of the late James; uncle of Kerrie(Rick) Baldesberger, Luke Baldesberger and Scot(Joy) Schafer. Family and friends will be received Sunday 2-4 & 6-8 PM at Paul Henney Cremation & Funeral Tributes, 5570 Library Rd., Bethel Park. Mass of Christian Burial will be offered Monday, 10 AM at St. Valentine Church, Bethel Park where Phil was a longtime active member. Phil was an Air Force Veteran during the Korean War. He retired from WWSW Radio Station as Chief Engineer after more than 35 years of service. He enjoyed hunting, fishing, traveling and most of all spending time with his family. Donations in his memory can be made to St. Valentine Church, 2710 Ohio St., Bethel Park, PA 15102.